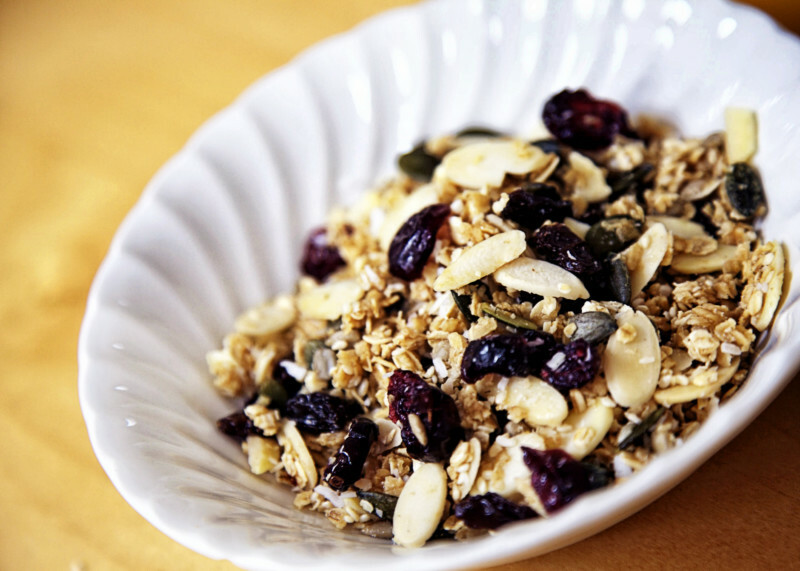 This healthy granola bursting with fibre, protein, iron and antioxidants is great with milk or yogurt for breakfast. It makes a delicious, energy-boosting start to the day or keep a handy supply to snack on in the afternoon and fight the afternoon energy slump. Gluten free too as long as you check the oats are free from gluten. In a large bowl mix the oil, honey and maple syrup. Add the sesame seeds and stir well. Tip the oats, pumpkin seeds, sunflower seeds and flaked almonds into the bowl and mix. Divide the mixture between 2 baking trays and bake for 15 minutes. Remove from the oven and add the berries, cherries and desiccated coconut to the granola. Mix thoroughly. Bake for another 8 - 10 minutes. Transfer the granola, immediately, to another tray to cool down. Store in an airtight container at room temperature for up to a month.